Pebble Island is the third largest offshore island in the Falklands, a 45-minute flight from the capital, Stanley. Since 1846, the island has been run as a sheep farm and today is home to some 10,000 fine-wool sheep. 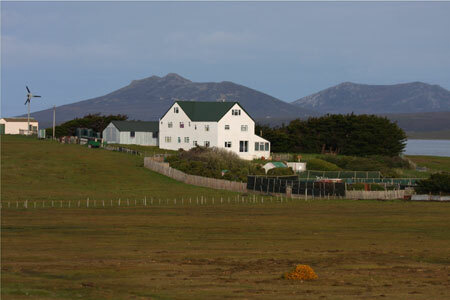 Pebble Island Lodge sits at the heart of the only settlement on the island, located on a narrow isthmus close to Elephant Beach, the longest sand beach in the Falklands at just over 4 miles. There are more than 40 species of bird including four types of penguin and concentrations of sea lions as well as sand beaches, moor lands and rocky peaks, an extensive wetland area of international importance, and dramatic coastal cliffs. Pebble Island Lodge was formerly the farm manager’s house and was converted into a hotel in 1987. It was bought by the current owners in 2003. The house is being sold fully furnished, fully equipped and ready for operation with tourist bookings in place for the 2010/11 summer season. The current owners run guided off-road 4×4 tours, which in 2008 generated 21% of the lodge income. There is, however, no obligation for the lodge’s guest house status to continue. It has its own vegetable gardens, four sheltered lawns, a large chicken run, six bedrooms aswell as a separate three bedroom managers’ flat.